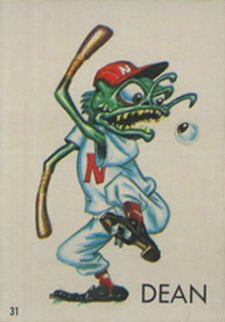 1965 Topps Ugly Stickers are, in a lot of regards, an embodiment of all the strange and bizarre creatures kids like to draw. In notebooks, on scrap pieces of paper, on top of a desk, it's a timeless ritual. Equally timeless is this set of stickers that continue to draw interest today. Although the 1965 Topps Ugly Stickers checklist runs only as high as 44, a complete master set has 164 cards. That's because all but a handful have four total versions. 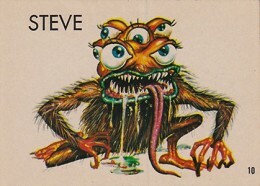 Each card has a detailed painting of an odd creature. Hair, exaggerated and just plain weird, they're the type of thing a lot of grandmas in the 1960s would label as being ugly. Cards feature the artwork of Norm Saunders, Wally Wood and Basil Wolverton. Unlike a lot of the company's other sticker cards, 1965 Topps Ugly Stickers are not die-cut. Besides the creature, cards are very plain. All the stickers that have multiple versions come with white backgrounds. Paintings are accompanied only by the name and a small number. Single-versions cards stand out more. That's because their backgrounds either have a painting or are plain black. Card backs for the entire set are tan and have no visuals. Topps revisited Ugly Stickers in 1973 with a new set. More recently, they revived it for their line of Artists on Demand sketch cards that are available direct through their website. Looking for the “Granny” sticker. Have one? 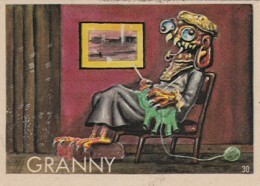 I have 1965 grandma card great condition would abyone be intrested in buying it? PSA 9 vintage Topps Ugly Stickers MIKE monster trading card 1973 NICE 1970's !! !